At this Science at NASA site, you'll learn about the physics of sand movement and the research done to understand mechanisms of dune migration. 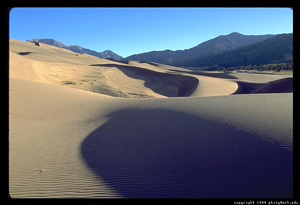 The physics and the landforms are interesting because granular materials like sand show properties of both solids and fluids, including saltation, sheet flow, and avalanches. This site provides a summary of the physics involved along with photographs of sand dunes on Mars, close-ups of sand particles, and a sand dune advancing on a town. This resource was a Physics To Go feature from July 1, 2007 until July 16, 2007. View the feature here! Images, text, and diagrams may require specific permission for use. T. Bell, (NASA Marshall Space Flight Center, Huntsville, 2002), WWW Document, (http://science.nasa.gov/science-news/science-at-nasa/2002/06dec_dunes/). T. Bell, City-swallowing Sand Dunes, (NASA Marshall Space Flight Center, Huntsville, 2002), <http://science.nasa.gov/science-news/science-at-nasa/2002/06dec_dunes/>. Bell, Trudy E.. City-swallowing Sand Dunes. Huntsville: NASA Marshall Space Flight Center, December 6, 2002. http://science.nasa.gov/science-news/science-at-nasa/2002/06dec_dunes/ (accessed 25 April 2019). Bell, Trudy E.. City-swallowing Sand Dunes. Huntsville: NASA Marshall Space Flight Center, 2002. 6 Dec. 2002. NASA Marshall Space Flight Center. 25 Apr. 2019 <http://science.nasa.gov/science-news/science-at-nasa/2002/06dec_dunes/>.